Description: After Sophie Enright catches her long time boyfriend in a compromising situation with a coworker she heads home to St. Dennis to take a look at her life. She realizes she misses her family and is becoming dissatisfied with her career as a prosecutor. She decides a move is in order to be closer to her family and to pursue her dream of owning a cafe. She meets landscaper Jason Bowers and sparks begin to fly. However, when it seems like their dreams may contradict each other can they make it work? 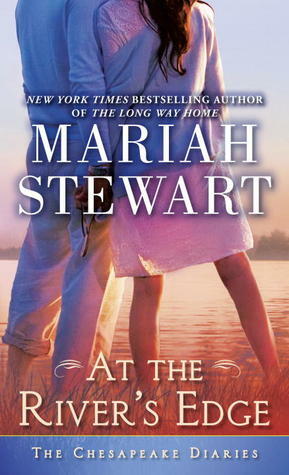 My Impression: Mariah Stewart has long been one of my go-to author with her more suspenseful books but I've really enjoyed the softer change of pace with the Chesapeake Diaries. I read the first of the series in December (review) and enjoyed it. Normally I don't mind reading books out of order but I think this is a series that would be better if read in order. There is so much of the town's history and family relationships that are explored little by little in each book that it's a much deeper, more developed read if read in order. I loved Jason, he's intense with his own baggage but still is able to develop healthy positive relationships with people. I like that he does what he feels is the right thing in regards to Curtis and Logan. I found Sophie a little less likable and all the secret keeping from her family got a little annoying. However, I love that Stewart makes very different characters for each of her books and it's not the same type over and over just in different situations. I also love her ability to draw a warm and friendly town environment without being overly cutesy or over the top drama. The characters aren't perfect but are all the more realistic for that. This is warm comfortable reading - perfect for a rainy day with a cozy blankets and hot chocolate. I can't wait to read the rest of the series! Would I Recommend this Book? : Yes, but I think it's better if you read them in order. I think that I probably would love this series even more if I had read them in order. Sometimes I find it hard to keep track of all of the characters and I think that is due to the fact that I've only read two books in the series (this one and the one before it). I still love the cozy comforting feel to these books so I will definitely read the first one at some point soon :) Great review! Thanks! I think this is definitely a series that needs to be read in order though I need to dig #2 out of the pile to be sure!